Two lakes framed by beautiful plane trees. Hyde Park is an iconic park in Perth's inner suburbs, bordered by Perth, Mount Lawley, Highgate and North Perth. Famous for the statuesque plane trees fringing its lakes, it has a variety of attractions for people of all ages. People of differing age, strength and mobility can use the LifeTrail exercise stations, situated at intervals around the park. The path around the central lakes is also a popular walking and running track. The recently rebuilt stage area towards Vincent & William streets is the scene for many community events throughout the year, particularly in the warmer months: the Hyde Park Fair is an annual event, there are summer concerts, a holiday barbeque event and Christmas carol nights. Free barbeques, picnic areas, drinking fountains and gazebos are located around the park; the gazebos can be booked through the Town of Vincent. There are two toilet blocks, one near the stage area and the other near the larger playground. Abundant wildlife includes ducks, black swans and other waterbirds, ibis, turtles, frogs and birds. The various areas of the gardens are also a popular wedding and photography venue. For families, Hyde Park offers two playgrounds. The smaller, near the corner of William and Glendower streets, has modern play equipment on a softfall surface. The equipment is most suitable for children aged between four and twelve years. 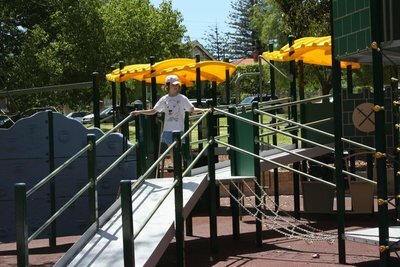 The larger playground is near Glendower and Throssell streets and was opened in December 2010. It is designed as a universally accessible playground, with ramps on the main play structure, a Liberty swing for people in wheelchairs, and swings suitable for children with mobility and muscle tone problems. There is a small sand area but most of the playground is on softfall. This playground suits children aged between two and twelve years. Why? Something for people of all ages. Where: William & Glendower sts, Perth. My kids love the larger playground area but i feel it needs to be shaded properly for our perth weather.